Ballet music is occasionally programmed in concert halls, in the form of a suite or selection of fragments. Full-length ballets are understandably much rarer, yet the ones that are able to survive the absence of stage action can in the right hands become spellbinding experiences. This is exactly what happened with a concert performance of Serge Prokofieff's 1935 Romeo and Juliet by Musica Aeterna under Teodor Currentzis. Offering under the title "If love could be" a fortnight of music events focused on the themes of passion and love, this year's Klara Festival – the only annual broadcasting festival in Belgium – couldn't overlook Shakespeare's famous star-crossed lovers. But nonetheless to have the complete Prokofieff ballet music in the concert hall was still something of a miracle. Teodor Currentzis is artistic director of the Perm Opera and Ballet Theatre and of the Musica Aeterna ensemble which he formed in 2004 and currently resides in Perm as the theatre's main orchestra. The Greek-born maestro studied in Athens and completed his formation as conductor at the St. Petersburg Conservatory with the famous Ilya Musin, teacher of among others Valery Gergiev and Semyon Bychkov. 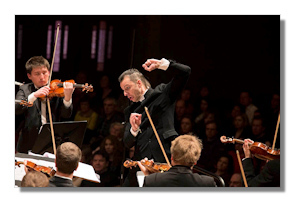 By all accounts a controversial personality, Currentzis has been dividing opinions as much by his conducting, as by his at times provocative statements and very Russian-styled manner of self-promotion. Be that as it may, his traversal of Prokofieff's Romeo and Juliet at the Brussels Centre for Fine Arts was a real stunner. To see him conduct his Musica Aeterna is already something of an experience. Anyone missing the dancers on stage? Currentzis replaced it with a bit of theatre of his own. A long lanky figure, hair in a tail, he is more rock star than maestro and you could hear people gasp the moment he entered the auditorium; a very Liszt-like persona in fact, half charmer, half demon – and by his attire, partly priest as well. Currentzis conducts without baton, but wildly waving his arms, hissing, tapping his feet, dancing and jumping, he seems to think he needs his whole body to draw the music out of his ensemble. It's thankfully more than just cocky posturing and this performance proved amply that Currentzis not only has a complete understanding of this score, he also knows how to get exactly what he wants from his orchestra. The 100 or so musicians of Musica Aeterna responded as one, playing as if their lives depended on it. That they were standing for the whole concert (only the cello players were seated) seemed to sharpen their focus. It was a sight to behold and you will be hard-pressed to find such collective fervor, dedication and joy at making music. Musica Aeterna boasts some excellent soloists too: all desk leaders of the string sections delivered magnificent solos, the first clarinet was outstanding, as was the first horn. The brass was as punchy and biting as you could wish for this music, and with the percussion clearly able to raise the dead. The strings proved a wonderfully flexible group, with Currentzis taking extra care of the polyphony of Prokofiev's writing, revealing plenty of details in the orchestration hardly noticeable when played from the theatre pit. The ballet came vividly alive with a great feel for theatricality, correct characterizations (even if Juliet seemed a very hot-tempered teenager during her first appearance), and without any fear of exaggeration. Taking no prisoners, Currentzis pushed dynamic contrasts to extremes and conjured the most improbable shades and colors from his orchestra, hijacking the listener for about two hours in an emotional rollercoaster. The score was as good as complete. Currentzis cut the opening scene of Romeo (#2) after the Introduction, a few dances on the market in Act 2 as well as the second scene at Friar Laurence's (#28), and replaced Juliet's variation at the ball (#14) with the Morning Serenade (#48) – something which can only be explained by theatrical practice. Still, nothing essential was missing. It was played in two parts, with the interval occurring between Acts 2 and 3. This allowed Currentzis to treat each half as a continuous dramatic arch, building gradually in intensity and culminating each time in stark tragedy – the death of Tybalt in the first part, the suicide of the two lovers in the second. Musically as well as dramatically this made perfect sense as Prokofieff kept some of his most devastating music for these scenes – and Currentzis and his orchestra made sure we wouldn't forget them that easily. Played practically without any breaks between the numbers, as in a theatrical performance, the music gained tremendous sweep. Several scenes along the way knocked you out of your seat – the Dance of the Knights never sounded more threateningly arrogant and the two fortissimo chords of the Prince's decree (repeated at the start of Act 3) were powerful enough to keep anyone mesmerized for the rest of the concert. Tempi were often on the fast side, but Currentzis knew when and how to slow down as in the beautifully played Madrigal offering a tender evocation of beginning love, or the comforting familiarity of friar Laurence depicted by warm cellos. The Balcony Scene, too, was lushly romantic and erupted in full-blooded passion, while the Bedroom duet breathed a sense of coming doom. The street brawls were particularly violent and the crowd scenes feted in vibrant colors. Some minor slips notwithstanding (like the rhythmically blurred Dance with mandolins or the too prominent lower brass here and there) this was a mind-blowing performance which immediately shoots towards the top of the most memorable concerts I have attended in some time. And do we need better proof than this that ballet music of this caliber can stand on its own? Brilliant!